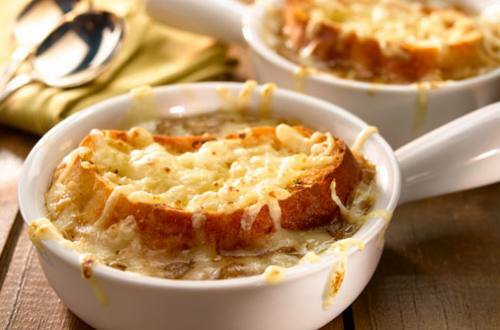 Buttery, golden onions and melted cheese are at the center of this classic French onion soup recipe, but add a little Knorr® Homestyle Stock and you get a dish with memorably rich flavor. 1 Melt margarine in large saucepot over medium heat and cook onions, stirring frequently, 15 minutes or until golden. Stir in garlic and thyme and cook, stirring constantly, 5 minutes or until onions are browned and very tender. 2 Stir in hot water and Knorr® Homestyle Stock Beef, scraping up brown bits from bottom of saucepan. Bring to a boil over high heat. Reduce heat to low and simmer uncovered 8 minutes. Stir in sherry. 3 Arrange 6 broiler-proof bowls on baking sheet. Evenly ladle soup into bowls, then top with bread and cheese. Broil 1 minute or until cheese is melted.